5 октября 2016 года Lamborghini стала обладателем рекорда круга "Нордшляйфе" для серийных автомобилей — купе Huracan LP 640-4 Performante проехало круг за 6:52.01. 20 сентября 2017 года Porsche 911 GT2 RS побил итальянского соперника, установив новый рекорд 6:47.3. Правда, 26 июля 2018 года и эта цифра пала — Lamborghini Aventador LP 770-4 Superveloce Jota показал время 6:44.97. Немцы не остались в стороне и сделали всё, чтобы вернуть рекорд себе. Воспользовавшись помощью команды Manthey-Racing, которая гоняется на Porsche и занимается тюнингом этих спорткаров, в компании доработали купе 911 GT2 RS и Ларс Керн, гонщик-испытатель Porsche и инженер-разработчик, установивший ранее рекорд 911 GT2 RS, превзошёл собственное достижение на 7 секунд — 6:40.3. Это новый рекорд "Нордшляйфе" для дорожных автомобилей. Примечательно, что Porsche 911 GT2 RS от Manthey-Racing оказался даже быстрее, чем McLaren P1 LM (дорожная версия McLaren P1 GTR от Lanzante) с его временем 6:43.2 и даже электромобиль Nio EP9 (6:45.9). В Manthey-Racing не раскрывают деталей о тюнинге 911 GT2 RS, сообщив лишь о новом сиденье водителя и общих настройках спорткара, адаптированных к конкретной трассе "Нордшляйфе". Stuttgart. Porsche has set another new record on the Nürburgring-Nordschleife in cooperation with Manthey-Racing. 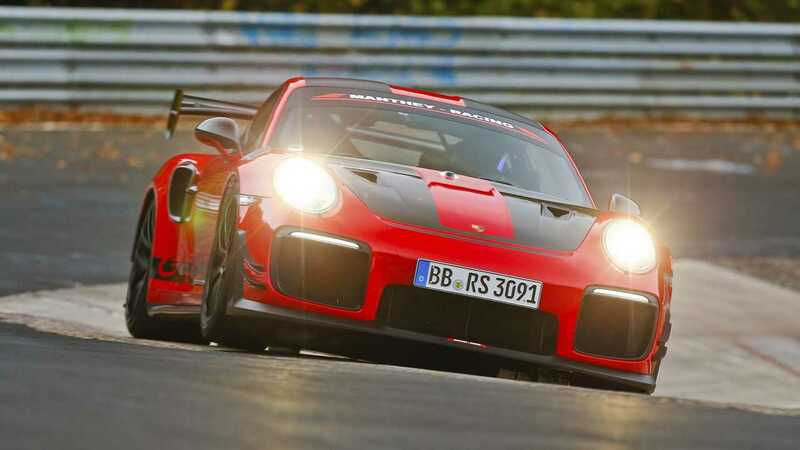 On Thursday, 25 October 2018, the Porsche GT2 RS MR with 515 kW (700 hp) completed a lap of the 20.6-kilometre long circuit in 6:40.3 minutes. No other road-legal vehicle has ever been so fast on ‘The Green Hell’ track. Lars Kern was at the wheel of the sports car, which had been especially set up for the ‘Nordschleife’ by Porsche engineers and Manthey-Racing experts. The Porsche test driver already set a lap record in September 2017 in a series-production Porsche 911 GT2 RS*. The Porsche GT2 RS was launched on the market in 2017 as the fastest and most powerful 911 of all time so far. In recent months, Porsche engineers used their know-how from development of the 911 RSR and 911 GT3 R race cars as well as the experience of Manthey-Racing gained in numerous successful races on the Nürburgring-Nordschleife. The targeted modifications included the areas of chassis and aerodynamics. The technicians focused on suitability for on-road driving at all times. In autumnal but dry conditions, Lars Kern optimally exploited the huge potential of the Porsche 911 GT2 RS MR on his record lap under the eyes of a notary. For the fuel, Porsche relied on Esso as a proven partner from motor sports. The driver's seat was the only modification compared with the version of the GT2 RS MR that can now be ordered from Manthey-Racing for club sport and track day events. A racing bucket seat was fitted in the record-breaking vehicle for safety reasons. This modification did not provide any weight benefits. The fastest and most powerful Porsche 911 made its world debut at Goodwood in the UK in June 2017. The 3.8-litre engine produces 515 kW (700 hp) and delivers a torque of 750 Nm. The top speed of the rear-wheel-drive sports car is 340 km/h. The two-seater weighs in at just 1,470 kilograms and accelerates from a standing start to 100 km/h in just 2.8 seconds. In September, Porsche presented the new Porsche 935, based on the ultra-modern technology of the 911 GT2 RS, at the Rennsport Reunion VI in Laguna Seca, California (USA). The exclusive vehicle, which is designed for track day use, will be delivered to customers next year in a limited production run of just 77 cars. The company Manthey-Racing is based in Meuspath at the Nürburgring and is managed by the brothers Nicolas and Martin Raeder. Porsche AG owns a 51 percent share in the company. Manthey-Racing offers services, part packages and race events for customers. The racing team from the Eifel region is the sole record holder with six overall victories in the 24 Hours of Nürburgring race. Among other things, the team from Meuspath is responsible for the two 911 RSR entered in the FIA World Endurance Championship (WEC). In this race series, Porsche achieved a class victory in the 24 Hours of Le Mans in June 2018. The Porsche GT Team also currently has a clear lead in the overall WEC classification.